"Fate itself will be torn asunder, should it be the will of the goddess." Seth is an imperial oracle from the Theocracy of Sanghalim in the west. Sanghalim is a vast desert empire led by the voice of its living deity, Kallimerina, the Avatar of Sanghalia. Serving the avatar are a circle of elite oracles, paladins, and priests. Seth is counted among these. On the orders of Kallimerina, he has set out to the blasted lands of the south, to aid Magdelina Larington in stopping the resurrection of the Dark Overlord Rexan. He’s an attendant to Kallimerina, and a court oracle of Sanghalim, meaning that he receives visions from the gods and is tasked with interpreting his visions and the will of Kallimerina to guide the nation. 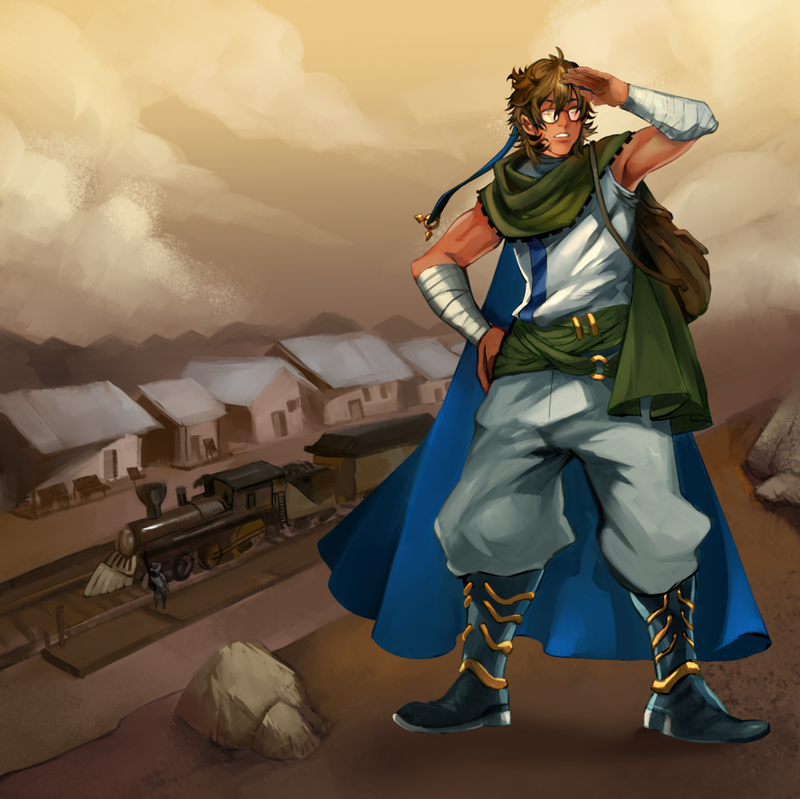 He is skilled in hand-to-hand combat, and was trained in the Imperial Palace, where he grew up, by the palace guards. He displayed an aptitude for divine magic and foreknowledge of things that were soon to happen as a young child of age 9. After this, he was taken from his family to live and serve as a steward in the Imperial Palace. He has memorized all the holy scriptures of Sanghalia, and recites them often when fighting, giving orders, or commenting on the actions of others. Most of his friends find this a particularly annoying trait. He is acquainted with Vanaah, but the two are not really close friends. He knows Joal through his duty of posting bounties for creatures that terrorize (or will soon terrorize) the Sanghalese deserts. Seth and Amon get along well enough, but both are silent and moody personalities that don’t speak much outside of business. Shoshannah Kasselock was a childhood friend of his. He’s unsure of how to act around her, now that she is the avatar of Mak’terix. He used to give food to orphans as part of his duties as a steward. Through this duty, he met many of the poor children in Sanghalim, including Shekhtur, who is only a little bit younger than him. The two are acquaintances, but not particularly close. Outside of work, he gardens, and has a knack for growing vegetables and fruits, despite the poor weather in Sanghalim. Seth is one of 7 oracles that serve the empress, forming the Imperial Council. They work together with the council of tribal elders to govern Sanghalim. 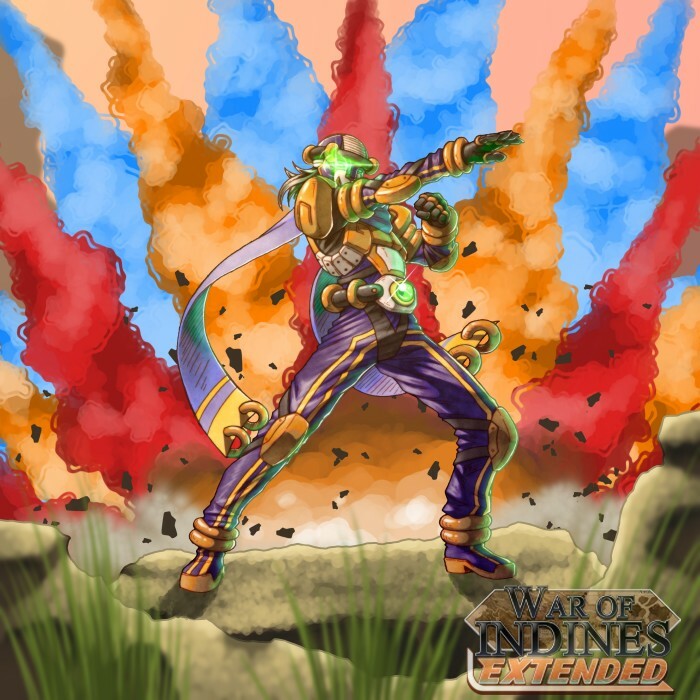 Seth is a control character who negates and counters his opponent's options. Using the powerful disruption effects on his Styles in conjunction with Beyond Eyes, he is able to defeat multiple options and smack down opponents who play too riskily. An ability to control and predict the options that both players will have in their hand is key to Seth's success. The inner-workings of a Seth-player's mind. Despite how Beyond Eyes appears, Seth does not try to hard read his opponents. Rather than aiming to beat a specific attack, Seth attempts to beat a wide range of attacks. 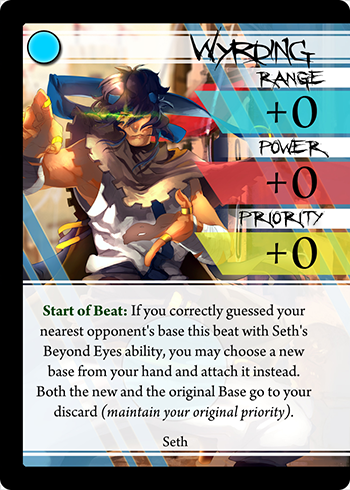 This is called "filtering" – most of Seth's Styles have wide-ranging effects that counter large swathes of the opponent's possible attack pairs. In addition, Beyond Eyes allows Seth to filter out an additional base per beat, by increasing his stats to the point that he is able to out-speed and either stun out or out-trade that attack pair should he guess that base. This process allows Seth to warp the base pentagon and achieve an almost unbeatable position by filtering out attacks that would ordinarily beat his attack. Thus, Seth attacks may be thought of as a Style, a Base and a Guess working in harmony to filter out as many opponent attacks as possible and therefore beat their pair – no matter what it is. In addition to each base in the pentagon helping to filter out two other bases under ordinary circumstances, Mimic's, Fool's, and Vanishing are your bread and butter Styles for helping filter out attacks. Typical moves to maximize filtering are Mimic's Strike guess Grasp, Mimic's Burst guess Shot, Vanishing Shot guess Drive and Fool's Omen guess Shot when the opponent's Burst is down. Powerful when paired with Dodge. Since Seth has overall poor stats on his Styles, he should be on the lookout for "safe attacks" – attacks that win against some pairs, and cause null beats against others. This allows him to preserve his personal safety while waiting for the opponent to slip up and get caught in the filter. Seth's kit grants him an immense amount of utility in this regard, and he rarely if ever has a reason to take large risks, because he can filter out most of the obvious or dangerous attacks his opponent can play. Do not be afraid to play Seth's trump card, and what is, in my opinion, the best pair in the game, Wyrding Dodge. Weak only to clashes, this pair allows Seth to safely evade opponent's attacks with Dodge while preserving the chance of guessing their base correctly and moving into range 1 for a 5 power Omen – all done without any risk of Seth being hit. Wyrding Dodge also offers full-board confirm when Dodge is swapped out for Drive. You can pair it with guesses of the opponent's likely base, or simply guess bases that clash Dodge in order to minimize the chances that you end up in a bad clash situation. With great positioning, Justice Kicks are easily landed. Seth relies heavily on manipulating discards and positioning to his advantage by stripping away opponent's options. At the same time, since his re-positioning and hit confirm tools are limited, he has to be careful to maintain his preferred range of 2 and 3. Moving to an extremely far range (5 or 6) is not recommended – while he can stave off attacks with Vanishing Shot, he doesn't have many other means to close back into range. Therefore, smart use of Compelling Drive and Wyrding Dodge is necessary in order to "fix" Seth's positioning and get him back to workable ranges, if he is trapped at extreme ranges, or in unfavorable positions. Powerful control kit that can counter nearly any attack. Access to Wyrding Dodge, the game's best attack pair. Extremely safe and can produce many "sure-win" beats. Punishes card lock, bad positioning, and predictable play with large pay-outs. Forces opponents to play sub-optimally. Very vulnerable to card lock. Hit confirm and range are mediocre at best. Relies on filtering to be effective - if he is unable to do so, he becomes extremely weak. CLICK HERE if you want to watch Seth's BattleGUIDES video. Lore Section - Brad Talton Jr.